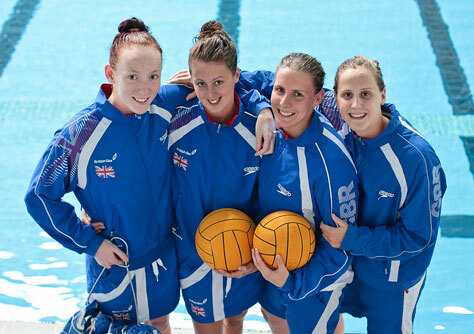 FOUR MMU students have been included in a Great Britain squad of 13 for the women’s waterpolo at the London Olympics. Robyn Nicholls, Rebecca Kershaw, Fiona McCann and Angela Winstanley-Smith will make history as part of the first GB women’s team to compete in an Olympic Games. Robyn, 22, is studying Economics and Angela reading French, while Fiona and Rebecca graduated in 2011 with a Masters in Marketing and a BA in Psychology and Education respectively. Great Britain claimed four gold medals in men’s water polo at the early Olympic Games, but have been absent from the competition since 1956. The women’s event has only been held at the last three Games, and Team GB’s women will be making their Olympic debut in London this summer. The quartet, who have trained together in Manchester since 2009, are doubly delighted to be selected because no-one from MMU was left out. Robyn, 22, is from Tyldesley, Manchester; Rebecca, 21, is from Morecambe, Lancashire; Fiona, 25, is from Chester, and Angela, 26, is from South Shields, Tyne & Wear. The Olympians all train at Manchester Aquatics Centre – the GB squads base, and jointly run by the city’s universities and the council. According to Fiona, the facilities at Manchester Met are second to none and she praised the University for being flexible about training schedules. “We all moved to Manchester because British Waterpolo based their national performance centre in the city allowing the squad to train together full-time. Robyn, the goalkeeper, said: “I developed my interest in water polo watching my brother play when I was eight or nine. And the girls can be hopeful of a medal having beaten have beaten some of the world leaders over the past year or so, such as Greece, Italy and Germany.